While recent economic growth in Africa has earned world-wide praise, that growth is not shared by all, according to Geraldine J. Fraser-Moleketi, Special Envoy on Gender for the African Development Bank (AfDB) speaking in Addis Ababa, Ethiopia in January, 2015. Women, in particular, have not been able to participate in and contribute to the growth process and as a result, the continent has experienced increasing disparity of income and overall human development. CFTC’s Program Operations Manager Amboka Wameyo presented a case study on gender and inclusion focusing on CFTC’s food security programming in northern Ghana to the Ontario Council for International Cooperation (OCIC) during International Development Week on February 6, 2015. We hope you enjoy her summary! Ghana has succeeded in halving its poverty rate, becoming one of the few countries in sub-Saharan Africa to achieve the first Millennium Development Goal (MDG): the eradication of extreme poverty and hunger by 2015. However, the fruits of this success are not equally shared across the country. Northern Ghana remains disproportionately burdened by poverty and food insecurity compared to the southern areas of the country. While residents of northern Ghana in general suffer from the inequitable distribution of economic gains, women in particular are further excluded from processes to find solutions to food insecurity within an already-inequitable context. 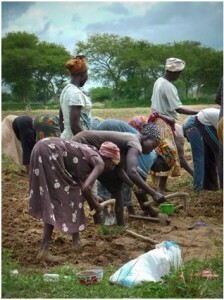 Recognizing the important role played by women in small scale agriculture – on which 85% of northern Ghana depends for livelihoods – and also the pivotal role played by women in promoting good nutrition within the household, CFTC has adopted a deliberate approach to target and include women as active participants in four strategies to promote food security. CFTC’s goal is to increase the participation of women in all climate-smart agricultural training programs conducted in its beneficiary communities in northern Ghana. Through a two-step process, we first recruit and train trainers at the regional level across the Upper East, Upper West and Northern Regions of Ghana and then ‘step down’ that training to the community level. At both steps, we endeavor to secure 40 percent participation by women. Low levels of literacy and language are barriers to inclusion in regional training programs particularly if the training is conducted in English – the country’s official language – and these barriers are exacerbated for women who traditionally have had fewer opportunities to learn English. To address the language barrier, step-down trainings are conducted at the local level by members of the community who have relationships with (and speak the same language as) local residents. The target of 40 percent participation by women in training activities has been achieved in the various projects supported by CFTC. 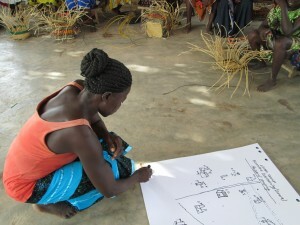 For example, CFTC reported that as part of its CHANGE project in 2014 577 participants comprising FBO leaders and small holder farmers (69% women) from 17 Northern Ghana communities received basic skills training in community management of improved post-harvest storage facilities and storage methods. Another approach being used to encourage participation by women spearheaded by CFTC’s local partner RAINS, in the Northern Region, is peer-to-peer mentoring. Through peer-to-peer sessions women farmers who have been trained in appropriate indigenous seed selection accompany other women to markets and provide them with hands-on practical training on seed selection and other aspects of growing indigenous crops suited to the climate in northern Ghana (and indeed, the micro-climates that exist across the three northern regions). CFTC supports local agricultural extension services delivered by the Ministry of Food & Agriculture, which complement those of the community extension agents. Local extension agents hired by CFTC partners conduct farm-to-farm visits and reinforce training already received. Because female farmers are more receptive to female extension agents, we have deliberately worked to recruit and train female extension agents. At the same time, male extension agents (of whom there are a greater number since extension services continue to be largely male-dominated) are trained to be gender sensitive during their visits to homes. One way to do this is to always ask to speak to both male- and female-headed households and not assume that only the male hold of household needs to be trained or supported through the climate smart agricultural process. The extension agents also deliberately provide advice and support on crops that are grown and tended mainly be women – for example grounds nuts and thirdly the extension agents are encourged to plan for meetings and visit during times when women are available. For example, women tend to be busy with household chores in the evenings and therefore visiting homes during that time would mean that many women would not be available for mentoring and support. Agriculture—even small-scale agriculture in which many women are involved—requires financial resources. CFTC works with our local partners to promote savings and loans groups that help women save and borrow during intense farming periods. The groups target women deliberately because gender analysis has shown that within the same farming household men tend to have more access to and control over the means of production: land, farm inputs, income to use for agricultural production (as opposed to household necessities). 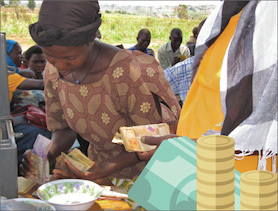 Through credit and savings groups, CFTC has created opportunities for women to be included in the process of generating and accessing funds. Even more than this, CFTC and our partners are working to instill a culture of credit/savings in which women are able to play a greater role than ever before. CFTC and its partners directly target women to train them in agricultural production at a scale larger than for domestic use, which often involves enabling women to secure land to grow crops that have greater cash value. We have also established, through our partner TradeAID Integrated in the Upper West Region of Ghana, non-agricultural revenue streams for women basket weavers, training them on business and marketing skills, and opening up national and international markets for their goods. Governments both federal and district governments have responsibility for shaping agriculture policy. The Northern Ghana district assemblies adopt a participatory approach to policy making providing spaces for residents to make submissions on policies that are being revised (for example the District Assembly Medium Term Development Plans (MTDP)). CFTC working through its partners had been deliberate if providing training to small holder farmers on advocacy thus equipping them for discussions with policy makers. 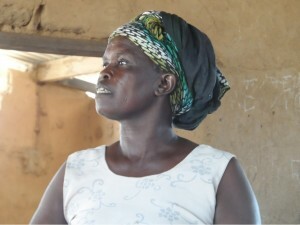 Deliberate steps are also taken to encourage women to participate in these policy discussion although policy making particularly around land ownership and exploitation has traditionally been a male domain. The objective of the gender equality focus adopted by CFTC is to ensure that women and their children benefit from the development that is occurring all around them, equally to the benefits that men are gaining. However, the focus on inclusion recognizes that women are not a homogenous group in themselves. 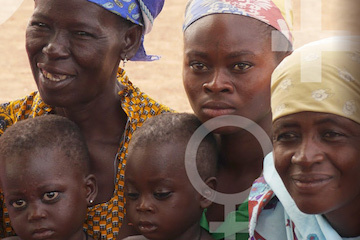 In northern Ghana, women can be further marginalized by various categories including disability and age. Age is especially important as younger women typically lack the community status to speak in the presence of older women. Women with disabilities may not come out to trainings or community gatherings especially if access is not provided. Going forward, it will be important that we expand our ‘inclusion’ lens to include age and disability. 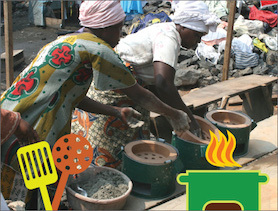 Energy-efficient stoves cut cooking time by making more efficient use of fuel, reducing reliance on environmentally-damaging charcoal or firewood. Credit and business skills training gained in micro-finance programs take women and children out of poverty and into a brighter future. 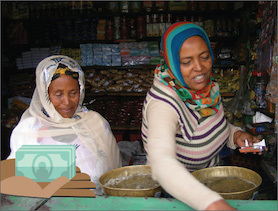 Nurture innovation and start a local entrepreneur on the road to self-sufficiency with a small business start-up loan.